Free-standing nanomembranes are two-dimensional materials with nanometer thickness but can have macroscopic lateral dimensions. We develop a fracture model to evaluate a pre-stretched free standing circular ultrathin nanomembrane and establish a relation between the energy release rate of a circumferential interface crack and the pre-strain in the membrane. Our results demonstrate that detachment cannot occur when the radius of the membrane is smaller than a critical size. This critical radius is inversely proportional to the Young’s modulus and square of the pre-strain of the membrane. Free-standing ultrathin nanomembranes are a new class of two-dimensional materials that possess nanoscale thickness across macroscopic dimensions. Such nanomembranes are not only ultra-lightweight but also robust and flexible. It has been reported that elastic moduli of ultrathin nanomembranes can be 1–10 GPa with ultimate strengths of up to 100 MPa [1, 2, 3, 4, 5, 6]. These striking properties of free-standing nanomembranes have resulted in a broad spectrum of applications in separation, sensing, biomedicine and energy harvesting [7, 8, 9, 10]. These free-standing nanomembranes are usually subjected to residual tensions induced during formation or by thermal mismatch. As a result, they may detach from the suspending micro-holes and lose their functionality [11, 12]. Experiments have demonstrated that smaller free standing membranes are structurally and thermally more stable than larger ones [9, 10]. This size dependence is also observed by Cheng et al. 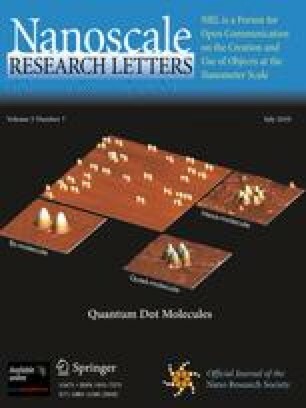 who fabricated free standing membranes composed of highly ordered arrays of gold nanoparticles linked by single strand DNA molecules. Briefly, these membranes are formed using the following process: first, droplets of a solution consisting of 13 nm diameter gold nanoparticles capped with 5′-thiolated single strand DNA (ssDNA) is dried on a thin silicon nitrate substrate with micron size holes in it. Satellite micro-droplets were formed and trapped in these microholes due to pinning of contact lines by the hole edges. As solvent evaporated, these pinned satellite micro-droplets thinned and formed monolayer nanoparticle membranes. Pre-tensions were built up on the membranes during this drying stage. It was found that these membranes tended to detach from the edges of larger microholes, but not smaller ones (Fig. 1). Equation (3) shows why sheets over smaller holes (smaller R) is less likely to fail. This conclusion is also valid for non-circular shaped micro-holes; in this case R should be replaced by the characteristic length of the micro-hole. where G is the energy release rate of the crack. 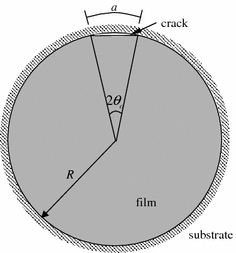 Energy release rate is the elastic energy per unit film thickness that would be released if the crack were to extend by a unit distance along the interface. 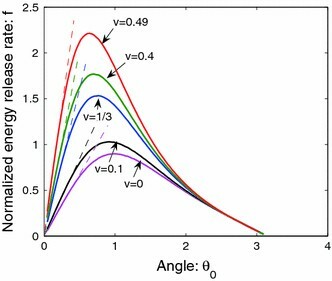 In this analysis, deviation of the crack trajectory from the interface (e.g. in cohesive failure) is assumed to be small so that the energy release rate G can be computed by assuming the crack is right on the interface. where f*is a numerical constant which depends only on the Poisson’s ratio of the membrane. Equation (9) also implies that stiff membranes are easier to detach than soft membranes for the same W and Open image in new window This result is consistent with our preliminary experimental results. In these experiments, the stiffness of the membrane can be tuned by varying the length of the DNA molecules attached to the gold particles . However, more data is needed to confirm this result. Our experimental observations suggest that R c is in the range of 1–4 μm. The Young’s modulus E of a typical membrane is reported to be about 6.5 GPa . Assuming ν is 1/3, the pre-strain Open image in new window is estimated to be 0.12%. This estimate is based on the initial slope of the force–displacement curve of indentation tests , where we have assumed that the force–displacement curve is controlled by the pre-tension for small deflections and approximated the indenter as a point load. There is no direct measurement of W. Using the values of R c E Open image in new window and v listed above, W is estimated to be 15–50 mJ/m2, which is consistent with the strength of van der Waals interaction . In summary, a fracture mechanics model is used to explain why small free-standing membranes are more resistant to detachment. We show that detachment can be prevented by making the membrane smaller for a given pre-strain and W, which is consistent with our experimental observations. A useful expression for critical radius of the membrane is obtained and may guide future design of free-standing membrane systems. C.Y. Hui and R. Long are supported by a grant from the Department of Energy (DE-FG02-07ER46463). W. Cheng, M. Campolongo and D. Luo are partially supported by NYSTAR and the NSF CAREER award (grant number: 0547330). where Î”Î¸ o is a small increment in normalized crack length. We started the simulation with a very small crack and gradually increased its length. The calculation is tedious since each crack length increment requires remeshing and change of boundary conditions. This process was automated using a PYTHON script. The energy release rate was also computed using the J-integral option in ABAQUS. We found practically no difference between the two methods.